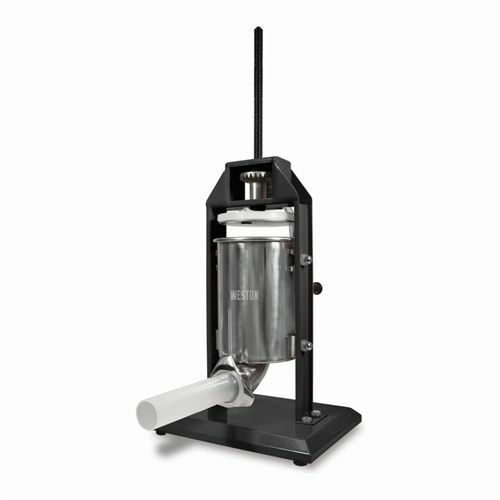 Weston�s rugged 5-pound Vertical Sausage Stuffer (model 73-0501-W) produces commercial-quality snack sticks, summer sausages, bratwurst, pepperoni, lunch meats - and much more! When you make your own bespoke stuffed meats you get to season meats to your own taste and stuffed sausages made at home are part of a healthy diet that avoids the additives and preservatives that are often found in commercial supermarket products. 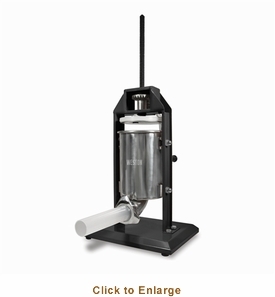 This single-speed vertical stuffer boasts a stainless steel cylinder that can tilt outward, making for easy meat loading; the air release valve on the plunger keeps air pockets out of your sausage during stuffing. With heavy-duty stainless steel gears and sturdy, stable rubberized feet this stuffer also disassembles for easy clean up (the metal turn handle is removable). And remember: hand wash only! Comes with 4 tapered stuffing funnels: 13mm (great for snack sticks), 20mm (pepperonis & bratwurst), 30mm (summer sausage) & 40mm (lunch meats). Note: this stuffer can not be paired with a motor, unlike some larger stuffers.